(i) In which sense is the GBG “creative” and is it compatible with the Glass Bead platform’s project? (ii) If not, can we invent a “Revisited GBG” (RGBG) to achieve the platform’s creative objectives? (iii) What could we learn from such an RGBG in terms of transdisciplinary research? In What Sense is the GBG “Creative”? In the book, two more or less opposing interpretations of the GBG can be found. With the above definitions, we see that the first interpretation of the GBG leads to essentially combinatory creativity (“new, bold, and original associations of themes”), while the second one reflects exploratory creativity in the conceptual space of the whole culture (“incorporating into it each new achievement, each new approach”). As far as transformational creativity is concerned, there is no clear evidence of such a possibility (“addition of new contents is subject to the strictest conceivable control by the directorate of the Game”); at most, it may be possible at the border, but is unlikely. Following this analysis, it seems that albeit creative in two fecund ways (combinatory and exploratory), the GBG as described in the original book may nevertheless be limited in terms of achieving the abovementioned aims of the Glass Bead platform, which include transformational creativity ( “universal transits that transform the sites between which they operate”). In the next section, we therefore propose to build a Revisited GBG (RGBG) by analyzing the evolution (since 1987) of the theory of Memory Evolutive Systems (MES), a mathematical methodology developed by A. Ehresmann and J.-P. Vanbremeersch (hereinafter abbreviated as EV).9 This RGBG will show how the rules of the GBG could be modified to allow for innovative transdisciplinary research achieving transformational creativity, and therefore meeting the objectives of the Glass Bead platform. MES are based on Category Theory, a mathematical domain introduced by Eilenberg & Mac Lane in 1945.10 This domain leads to ‘relational’ mathematics, in which the ‘structure’ of the objects is deduced from the relations between them. At the crossroads between mathematics, logic, and metamathematics, it reflects the main operations of the “working mathematician” (title of a book by Mac Lane, 1971, to which we refer for the main notions11)and has a unifying role in mathematics: “This theory of categories seems to be the most characteristic unifying trend in present day Mathematics” (Ehresmann, 1967). We define a category as a (multi-)graph C on which there is given a composition of arrows which is associative and with identities; here a graph G consists of a set of objects A, B, …, and a set of arrows f: A → B between them; a path of G is a sequence of successive arrows. More precisely, a category is defined as a graph C with a composition law associating to each 2-path (f: A → B, g: B → C) a composite gf: A → C satisfying: (i) each object A has an identity arrow idA whose right or left composite with f from (or to) A is equal to f; and (ii) the composition is associative so that each path has a unique composite whatever its 2-2 decomposition. We say that 2 paths are operationally equivalent if they have the same composite. An arrow is also called a morphism or link. Examples of categories are (i) “small categories” such as monoids, groups, posets, and categories of paths of a graph (composition = convolution), and (ii) “large categories” such as the category of sets Set and categories of (pre-)sheaves, toposes. (iii) Emergence of higher cognitive processes, up to consciousness, anticipation, and creativity. The next section will show how the progressive development of MES can be retraced as a RGBG called categorification of emergence in living systems. (i) Retrospection: Recall of ‘beads’ in the existing knowledge basis in relation with specific characteristics of living systems. It is played by gathering different authors’ quotes about them. (ii) Prospection-complexification: Creation of adapted categorical notions which become new ‘beads’ representing a mathematical model of the characteristics. The following table summarizes the successive steps with, on the left, characteristics of the living system recalled from the knowledge basis, and, on the right, name(s) of new beads transferring this knowledge into categorical notions. 1. “A system is a set of units with relationship between them.”12 The configuration of the system at an instant t is modeled by a category Ht: an object represents the state of a component at t, the morphisms represent the relationships between components. 2. “The whole is something else than the sum of its parts” (Aristotle). In Ht the complex “whole” is represented by an object C which ‘combines’ a pattern (or diagram) P of linked objects Pi representing a decomposition of C, so that C has the same operational role as P acting collectively. C is modeled by the colimit13 of P in Ht. 3. “Tout objet que considère la Biologie représente un système de systèmes; lui-même élément d’un système d’ordre supérieur.“14 To account for components of a living system with different complexity levels (atoms, molecules, cells, etc. ), we introduce (see EV) the notion of a hierarchical category, i.e., a category whose objects are attributed an integer, called its complexity level, with the property: an object C of level n+1 is the colimit of at least one pattern P of linked objects of levels ≤ n through which it can operate. 4. Koestler15 proposes the word holon to describe the “hybrid” nature of the components of living systems, comparing them to “two-faced Janus.” In a hierarchical category Ht an object C of level n+1 has such a “Janus” nature: it is “simple” with respect to levels > n+1, “complex” with respect to levels ≤ n. Then C admits at least one ramification down to level 0 (see Figures 1 and 2); its complexity order is the smallest length if its ramifications. 1. “La Dynamique, entendue au sens le plus général de science des actions du temps dans les états d’un système”16 To model the possible addition/suppression of components over time, we introduce the notion of a (Hierarchical) Evolutive System (see EV): a (H)ES H consists of: (i) the family (Ht)t of the (hierarchical) configuration categories of the system, indexed by its timescale Time; and (ii) for each t < t’, a functor, transition, from a subcategory of Ht to Ht‘ measuring the change. 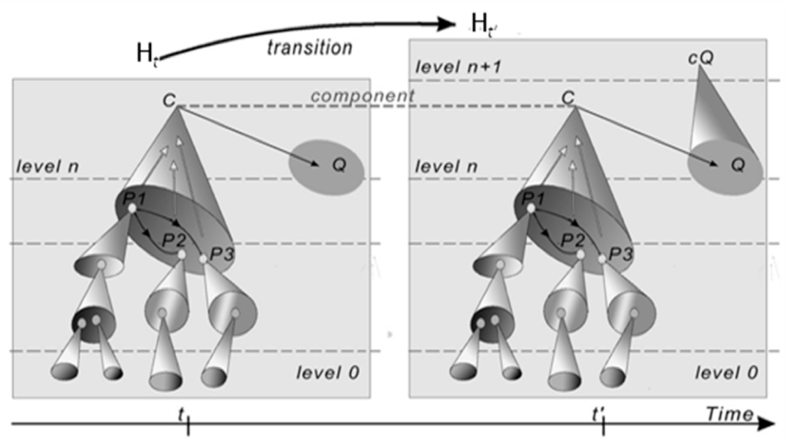 These transitions respect a transitivity condition so that a component of the (H)ES is a maximal family of objects (its successive states) connected by transitions; similarly a link between components is a family of transition-connected morphisms. A link has a propagation delay and is active (meaning: transferring information) or not at t.
2. Thom distinguishes four “archetypal singularities”: Birth, Death, Scission, Confluence.17 In a HES, these structural changes become: ‘adding’ a set A of external elements; ‘suppressing’ or ‘decomposing’ a set S of components; and given a set Π of patterns, combining the linked components of each P in Π by ‘adding’ a colimit cP to P. Given a procedure Pr on Ht with objectives of these kinds, we construct a category, called the complexification18 of Ht for Pr, in which these objectives are ‘optimally’ satisfied; it is explicitly constructed by induction (see EV). The transitions are generated by complexification processes. 1. “Degeneracy, the ability of elements that are structurally different to perform the same function or yield the same output, is a ubiquitous biological property … a feature of complexity.”19 In a HES, degeneracy is modeled by the Multiplicity Principle (MP) which ensures the existence of n-multifaceted components, where a component C is n-multifaceted if it is the colimit of at least 2 patterns P and Q of levels ≤ n which are structurally different and not connected20 by a cluster of links (see Figure 2). Thus, at a given time, C can operate through any one of them and switch between them, up to its own destruction. 2. “A composite Individual can be affected in many ways and still preserve its nature.”21 In a HES, a component C is a dynamic system which preserves its own individuation over time independent from its lower structure (e.g., a cell keeps its identity though renewing its molecules in time). C can operate through different ramifications, losing some of them and/or acquiring new ones. Emergence Theorem.24 If MP is satisfied, a complexification also satisfies MP and it can lead to the formation of multifaceted components of higher complexity orders and to the emergence of complex links between them. Iterated Complexification Theorem.25 A complexification of a complexification of Ht in which complex links play a role cannot be reduced to a unique complexification of Ht. 1. “Memory, as a constraint holding over events of the past and the present and a relation between them” (Ashby26). A MES is a HES with a ‘memory’ storing knowledge of various kinds for better adaptation to its environment. This memory is represented by a sub-HES Mem which develops over time by formation of multifaceted components of increasing complexity order; this development is a consequence of the Emergence Theorem, which, thanks to MP, also implies that the memory is both robust and flexible. 2. “Les agents n’ont qu’une représentation partielle de leur environnement, c’est-à-dire qu’ils n’ont pas de vision globale de tout ce qui se passe.”27 A MES also has a network of internal agents, called co-regulators, and its overall dynamic weaves their different internal local dynamics. A co-regulator (CR) is a sub-ES with its own function, complexity, and rhythm, which acts stepwise with the help of the memory. At a step from t to t’, it only accesses partial information through the active links arriving to its components during this step; they form an evolutive system called its landscape L at t. An admissible procedure Pr is selected on L (using Mem) and realized by a dynamic process during the step. The result is evaluated at t’: there is a fracture for CR if the expected result is not attained. 3. “Ability of agents to autonomously plan and pursue their actions and goals, to cooperate, to coordinate, and negotiate with others” (Wooldridge & Jennings28). The global dynamic results from interplay among the co-regulators to harmonize their different procedures, with risk of fractures for some co-regulators. 1. Hebb shows that a mental object activates a synchronous assembly of neurons.29 This assembly is not unique because of the degeneracy of the neural code.30 A MENS is a MES whose level 0 components represent neurons (with their activity) while a higher level component, called cat(egory)-neuron, models a more or less complex mental object M constructed as the colimit cP = cP’ of the different synchronous assemblies of (cat-)neurons P , P’ activated by M. Formally, a MENS is obtained through successive complexifications of the Evolutive System of Neurons (NEUR) whose links represent synaptic paths between neurons (with their propagation delay and strength at t). The degeneracy of the neural code implies that MENS satisfies MP. 2. “Existence of a Structural Core in human cerebral cortex, both spatially and topologically central … linked to self-referential processing and consciousness.”31 In time the memory of MENS develops a strongly connected sub-ES, called the Archetypal Core (AC), whose components are higher order multifaceted cat-neurons with many ramifications having their base in the Structural Core; they are linked by strong and fast complex links which form archetypal loops self-maintaining their activation for a long time. Archetypal records integrate significant memories of different modalities; they self-maintain their activation for some time through archetypal loops and diffuse it to lower levels by the unfolding of ramifications. AC represents the “Self” and acts as a motor in the formation of higher cognitive processes. 3. “The physical bases of conscious states consist of spatially dispersed, but re-entrantly interconnected, neuronal groups in a widely distributed set of brain areas.”32 The co-regulators of MENS are sub-ES based on specialized brain modules. Among them, we distinguish intentional co-regulators which are co-regulators directly linked to AC, whose components are of higher complexity order and have ramifications based on associative brain areas (cf. Crick’s “conscious units”33). These co-regulators and the links between their components act as a macro-co-regulator Int, in particular to form a landscape, called a macro-landscape. 1. “Conscious processes arise spontaneously and display intentionality, i.e., for the most part, each is about something.”34 An unexpected or striking event or problem S activates part of AC. The activation diffuses in AC via archetypal loops and propagates to different levels, down to lower levels through the unfolding of ramifications and switches between them. Transmitted back to Int, it leads to the formation of a long term macro-landscape (ML). 2. “Il y a dans le présent une rétention du passé et une protention du futur (de ce qui va immédiatement arriver).”35 ML unites and extends spatially and temporally the landscapes of the intentional co-regulators through exchanges between them. As archetypal loops are self-maintained, ML persists for a long time. Due to the activation delays, links coming from lower levels can transmit information of just-passed events, including ‘non-conscious’ information (about instinctive motor or perceptive behaviors, emotions and affects, reflexes,…), allowing ML to support embodied cognition. (iii) Complexification for the selected procedure(s). A particular case is the RPC-method for creativity37 which characterizes transformational creativity by iteration of complexifications where emergent complex links introduce rules for changing the rules, which must be slowly integrated. Playing a GBG can be interpreted as the evolution of a particular MES. The components are: those interested in the game, especially players and the judges (who act as co-regulators); and the Archives of the game, in particular the hierarchy of beads, which represent the Memory. The game combines patterns of already existing glass beads from different domains, forming colimits named by the corresponding hieroglyphs. 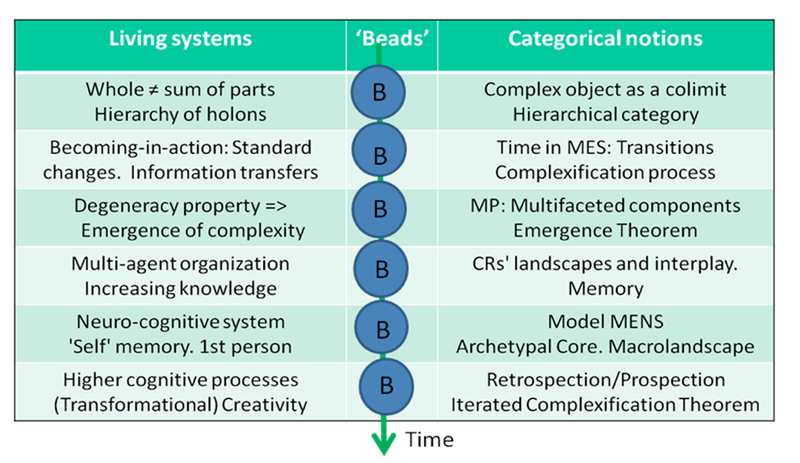 However, as we have seen, to develop higher order memory, the system should satisfy the multiplicity principle, meaning beads should not be rigid (as ‘glass’) but flexible and multifaceted in order to adapt to changes; moreover, transformational creativity would require the possibility of new rules changing the rules. In Hesse’s work, a basic assumption is that there exists a “large category” (a topos?) TOT representing the whole of knowledge, values and culture, and the Game takes place within it. The players only know a part H of TOT through their landscape L, and the aim of the game is to extend H by discovering more of the structure of TOT. These operations allow for combinatory or exploratory creativity since the complexification process ‘combines’ the Pr-specified patterns; and the selection of Pr leads to an exploration of mental spaces. They do not lead to transformational creativity because this would require “change in the conditions of change,” i.e., the formation of new complex links in successive complexifications (Iterated Complexification Theorem, Section II). 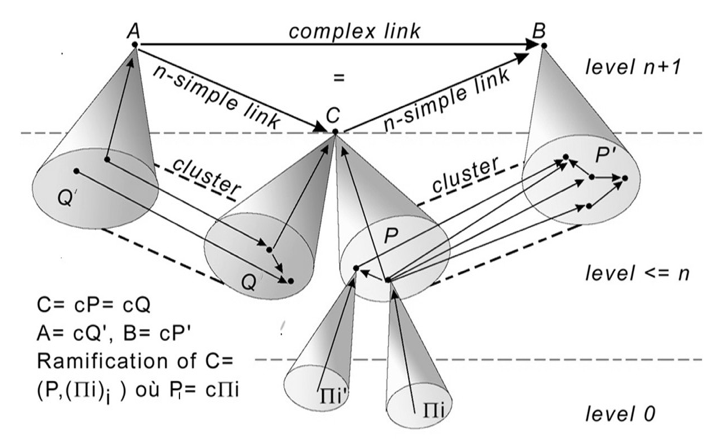 However, the image of a complex link appearing in C already exists in the cocomplete category TOT, and hence in its image H’ in TOT, so that it does not lead to further change in a later complexification. The RGBG played in Section II does not suppose the existence of TOT. Instead, it supposes there is real ‘evolution’ of the knowledge base (memory) over time, with addition/suppression of new knowledge. It can therefore lead to transformation creativity if the associated MES satisfies MP. Whence we arrive at the characteristics to be added to the Glass Bead Game in order for it to attain transformational creativity. 1. The beads should be multifaceted to allow for flexibility and ‘real’ emergence (MP). 2. They should be destructible (suppression of no more valid knowledge). 3. Rules “for changing the rules” (complex links) should be accepted. With these modifications, the Game could cover the aims of the Glass Bead platform and lead to innovative transdisciplinary research. Hermann Hesse. Magister Ludi, The Glass Bead Game. Trans. R. & C. Winston. New York: St. Martin’s Press, 1943. 11. Print. Margaret Boden. The Creative Mind; Myths and Mechanisms. 2nd ed. London: Routledge, 2004. 16-21. Print. Hermann Hesse. Op. cit. 10. See Andrée Ehresmann and J.-P. Vanbremeersch. Memory Evolutive Systems; Hierarchy, Emergence, Cognition. 1st ed. London: Elsevier Science, 2007. 402. Print. See Samuel Eilenberg and Saunders Mac Lane. “General Theory of Natural Equivalences.” Trans. Am. Math. Soc. 58, 1945. 231-294. Print. Saunders Mac Lane. Categories for the Working Mathematician. New York: Springer-Verlag, 1971. 317. Print. Ludwig von Bertalanffy. “Untersuchungen über die Gesetzlichkeit des Wachstums.” Roux’Archiv Issue 108 1926. Print. A pattern in Ht is a family of objects Pi connected by distinguished morphisms f: Pi → Pj. A cone from P to an object A of Ht is a family of morphisms si: Pi → A such that si = sj f for each f: Pi → Pj. cP = colimit of P if there is a colimit-cone (ci)i from P to cP such that, for each cone (si)i from P to A there is a one and only one morphism s: cP → A such that si = s ci for each i. “Each object considered in biology represents a system of systems, itself an element of a higher order system.” François Jacob. La logique du vivant. Paris: Gallimard, 1970. 326. Print. Arthur Koestler. Le cri d’Archimède, Paris: Calmann-Lévy, 1965. 452. Print. “Dynamics, taken in the most general sense of science of the actions of time on the states of a system.” René Thom. Modèles Mathématiques de la Morphogenèse. 10/18 collection. Paris: Union Générale d’Edition, 1974. Print. René Thom. Esquisse d’une Sémiophysique. Paris: InterEditions, 1988. 57. Print. The complexification H’ or Ht for Pr is the ‘universal solution’ of the problem: to construct a category H’ and a functor F from a sub-category K of Ht to H’ such that: (i) K contains A and does not contain S; and (ii) for each P in Π the pattern FP image of P by F admits a colimit cP in H’; if P has a colimit in Ht, cP is the image of this colimit by F; otherwise cP ’emerges’ in H’ to become the colimit of FP. For the explicit construction of H’, see EV. Gérald M. Edelman and Joseph A. Gally. “Degeneracy and Complexity in Biological Systems.” Proc. Natl. Acad. Sci. USA Vol. 98 Nov. 2001, 13763-13768. Print. In a category, two patterns with the same colimit M are structurally non-connected if they are not isomorphic and there is no cluster between them binding into the identity of M; then M is multifaceted. Benedict de Spinoza. The Ethics. 1677. Trans. R. H. M. Elwes. Web. Karl Popper. The Poverty of Historicism. London: Routledge Classics, 1959. 176. Print. Andrée Ehresmann and Jean-Paul Vanbremeersch. Memory Evolutive Systems; Hierarchy, Emergence, Cognition. London: Elsevier, 2007. Chapter IV: 402. Print. W. Ashby. 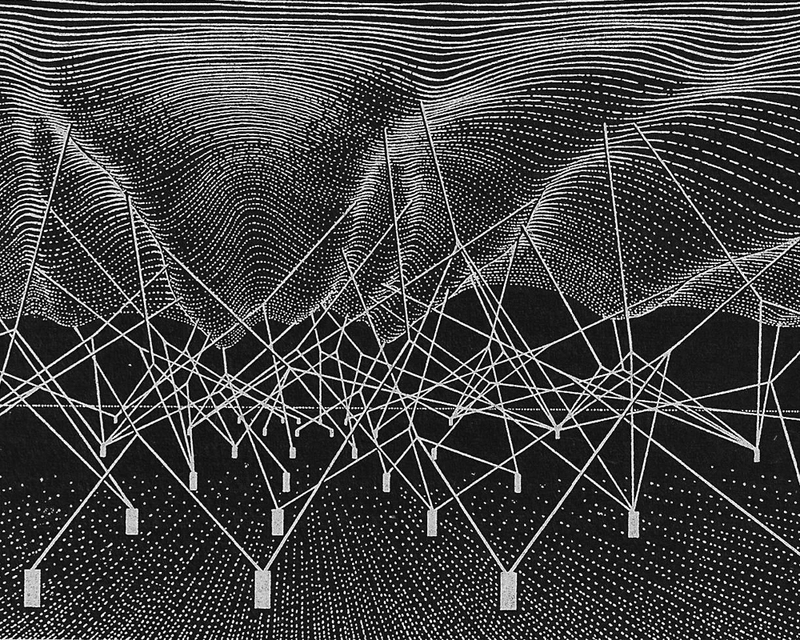 “Principles of the Self-Organizing System.” Principles of Self-Organization: Transactions of the University of Illinois Symposium. Eds. Heinz Von Foerster and George W. Zopf, Jr. Pergamon: London, 1962. 225-268. Print. “The agents have only a partial representation of their environment—that is, they do not have a global view of every event”; Jacques Ferber. Les systèmes multi-agents. Vers une intelligence collective. Paris: InterEditions, 1995. Print. Michael Wooldridge and Nicholas R. Jennings. “Intelligent Agents: Theory and Practice.” Knowledge Engineering Review Vol.10 No. 2 June 1995: 115-152. Print. D. O. Hebb. The Organization of Behavior. New York: Wiley, 1949. Print. Gerald M. Edelman. The Remembered Present: A Biological Theory of Consciousness. New York: Basic Books, 1989. 346. Print. Patric Hagmann, Leila Cammoun, Xavier Gigandet, Reto Meuli, Christopher J. Honey, Van J Wedeen, and Olaf Sporns. “Mapping the Structural Core of Human Cerebral Cortex.” PLOS Biology July 2008. Web. Gerald M. Edelman, Joseph A. Gally, and Bernard J. Baars. “Biology of Consciousness.” Frontiers in Psychology. Consciousness Research. 25 January 2011. Web. See the notion of “conscious units” in Francis Crick. The Astonishing Hypothesis: The Scientific Search for the Soul. New York: Macmillan Publishing Company, 1994. Print. Franz Brentano. Psychology from an Empirical Standpoint. 1874. Trans. T. Rancurello, D. Terrell, and L. McAllister. New York: Humanities Press, 1973. Print. “In the present, there is a retention of the past and a protention of the future (of what will arrive immediately).” Edmund Husserl. Leçons pour une phénomenologie de la conscience intime du temps. 1904. Paris: PUF, 1964. Print. Guerino Mazzola, Joomi Park, and Florian Thalmann. Musical Creativity. Berlin Heidelberg: Springer, 1998. 17. Print. Andrée Ehresmann. “MENS, An Info-Computational Model for (Neuro-)Cognitive Systems up to Creativity.” Entropy Vol. 14 2012: 1703-1716. Andrée C. Ehresmann is “Professeur Emérite” at the Université de Picardie Jules Verne, Amiens, and Director of the international journal Cahiers de Topologie et Géométrie Différentielle Catégoriques. Author or Editor of several books (e.g. Memory Evolutive Systems, 2007 and Integral Biomathics, 2012) she has published more than 100 papers on different mathematical or multidisciplinary domains.